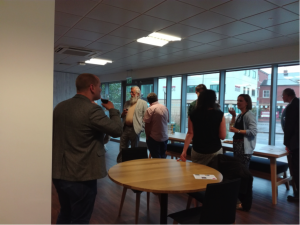 Here is a fascinating and detailed conference report by Val Derbyshire on a recent BARS-sponsored conference at the University of Derby. 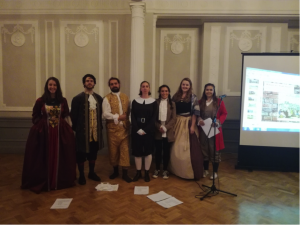 This month saw the Second International Conference of the John Thelwall Society, the theme of which was ‘Radical Networks and Cultures of Reform’. The question might be asked: why stage this important international event in Derby? The first panel (‘Origins’) provided the solution. It was here during recent years that world-renowned Thelwall scholar, Judith Thompson, discovered new manuscript material in the Derby Local Studies Library, resulting in a new edition of John Thelwall’s Selected Poetry and Poetics from Palgrave MacMillan. 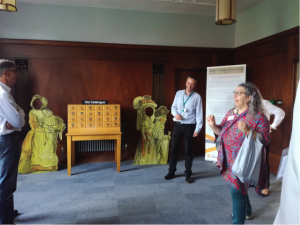 Professor Judith Thompson from Dalhousie University, Canada, re-enacts the moment she discovered the Thelwall manuscripts at the Derby Local Studies Library. During Mark Young’s opening paper, Mark gave a detailed and informative account of the provenance of the Thelwall manuscript and how – somewhat fortuitously – the discovery had been made only during the last fortnight that it was likely that the manuscripts came into the possession of the library via their purchase of the Bemrose collection during the early part of the twentieth-century. To compliment Mark’s paper, independent researcher Richard Gravil provided a detailed analysis of the marks and symbols used by Thelwall on his manuscripts and the works of other poets, including Wordsworth’s The Excursion. Thelwall included these within his poetics in order to ensure correct pronunciation. Thelwall was, of course, an elocutionist, as well as a poet, novelist, radical orator and polymath. After a short coffee break, Friday afternoon concluded with a panel detailing Thelwall’s connections to ‘Nature and Art’, where I then presented my own paper. I am a Doctoral Researcher from the School of English, University of Sheffield, and I spoke on Thelwall’s connections to novelist, poet and writer of works for children, Charlotte Smith (1749-1806) and how the use of artwork within their works demonstrates a convergence of political ideology. Finally, Peter Collinge (University of Keele) presented a fascinating analysis of Joseph Wright of Derby’s portrait of Ellen Morewood and how Wright’s somewhat radical portrayal of this interesting and determined woman exhibits her extraordinary business acumen and resolution. 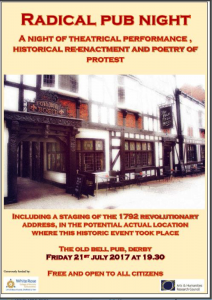 During the evening, the question of ‘Why Derby?’ was answered once again, when a team of actors re-enacted the 1792 Revolutionary Address originally staged by members of the Derby Political Society. This Society featured illustrious members such as William and Joseph Strutt, Erasmus Darwin, Samuel Fox, William Brookes Johnson, Henry ‘Redhead’ Yorke, Peter Crompton and John Hollis Pigot and demonstrates how Derby was at the centre of the Midlands Enlightenment. The Revolutionary Address was delivered in November 1792 to society members, before members William Brookes Johnson and Henry ‘Redhead’ Yorke travelled to France to deliver the speech on behalf of the society before the National Convention. 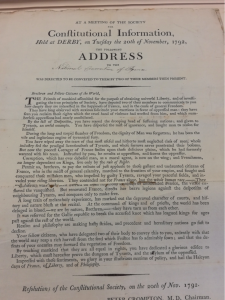 Original document of the ‘Revolutionary Address dated 20th November 1792’, delivered at the Derby Political Society in support of the French Revolutionary cause. Reproduced with the kind permission of Mark Young, Librarian, Derby Local Studies Library. The actors delivered a spirited re-enactment of the original events in the authentic setting of the eighteenth-century Old Bell Pub. They also re-enacted other political events including local protests over the sale and enclosure of Nun’s Green Common Land, which also took place in 1792. The actors who recreated the Radical Pub Night Historical Re-enactment during dress rehearsal at The Old Bell Pub, Derby. Featuring (from left to right): Melanie Hopkins as ‘A Lady of the Town’, Josh Hayes as ‘William Brookes Johnson’ and ‘Tully’, James Naughton as ‘Joseph Strutt/Samuel Crompton’, Jennifer Argent as ‘A Loyal Servant’ and ‘John Thelwall’, Noa McAlistair as ‘Erasmus Darwin’ and ‘Josiah Wedgewood’, Charlie Ayers as ‘A Peasant Girl’ and Kira Barnett as ‘Henry “Redhead” Yorke’ and ‘Lord G. Cavendish’. This was open to conference delegates but was also a public engagement event which was well-attended by members of the public with an interest in recent research in this area. ‘Radical Pub Night Poster’ promoting this public engagement event. This event was generously funded by WRoCAH/AHRC. I constructed the script, primarily from archival sources held at the Derby Local Studies Library. I also put together the costumes. The audience were particularly struck by the powerful eloquence of the speeches given by these historical figures. The evening concluded with a performance by the poetry of contemporary poet of protest ‘Liz Ferrets’. Liz sadly died eighteen months ago, and so the performance was given by Maggie, Liz’s mum. It was a touching and entirely appropriate close to the evening, demonstrating how the spirit of social protest is alive and well and is perhaps more necessary than ever in our troubled times. Saturday morning commenced with the key note address by Professor Jon Mee of the University of York. Jon focussed on ‘Thelwall’s Unheroic’ years which he elucidated as 1801-1806, in his discussion of Thelwall’s networks. This was a fascinating presentation which situated Manchester as the beating heart of scientific and technological innovation during this period. Writers of the time, Jon explained, access a discourse of industrial sublime in delineating Manchester at ‘the heart of [a] vast system, the circulating branches of which spread around it.’ He also provided an insight into what it must have been like to attend Thelwall’s lectures by accessing archival sources such as diaries which recorded the experiences firsthand. During the next panel, concerned with key Midlands Enlightenment figure Erasmus Darwin, the University of Derby History Department’s Paul Elliott described ‘A Brush with the Doctor’. This absorbing paper presented the experiences of artist Samuel Arnold as he took Darwin’s portrait. Arnold’s recordings of the time provide a real sense of Darwin as both a Lunar Society member, but also of his character as a man. This was followed by former Emeritus Professor Jonathan Powers (University of Derby) whirlwind tour through the evolutionary optimism and radical politics of Darwin. This was a spellbinding paper which provided masses of information for Darwin scholars. After a short break for lunch, Judith Thompson gave a wonderful paper presenting her findings in connection with the Derby manuscript. Judith explained how her research and her amazing discovery of the Thelwall manuscripts demonstrates the democratic values of intellectual accessibility embodied by such institutions as the Local Studies Library in Derby. In the spirit of intellectual accessibility, the conference delegates then proceeded on an excursion to the Library itself to view the wealth of holdings there. 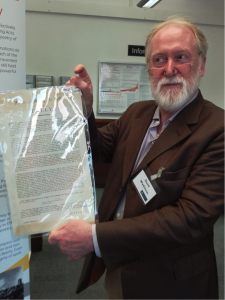 Delegates had the opportunity to view the Thelwall manuscripts, along with a host of other rare documents and books, including the original source documents regarding the sale and enclosure of Nun’s Green Common Land, from which the script of the historical re-enactment had been constructed. Conference delegate David Watkinson holds one of the speeches of ‘Tully’ (played by actor Josh Hayes during the historical re-enactment) protesting against the sale of Nun’s Green common land in Derby. This is one of the valuable documents held in the Derby Local Studies Library and was viewed during a conference excursion there. The day closed with a panel discussing Thelwall’s ‘Legal Trials’. AHRC-funded PhD Student from the University of York, Fiona Milne, presented an absorbing paper concerning the years following Thelwall’s legal trial and how his publications during these years urgently sought to vindicate his character before the tribunal of public opinion. The second inspirational paper in this panel was presented by David Watkinson, Barrister, who, before retirement, was the joint Head of Garden Court Chambers, which is now one of the largest sets of Barristers’ Chambers in the UK. Since 2004 this has been situated at 57-60 Lincolns Inn Fields, where John Thelwall taught and lived during the years 1813-21. David’s paper provided a detailed analysis of Thelwall’s trial and also speculated how its conduct – and potentially the result – might differ today. The final paper of the day was presented by Edmund Downey of the University of Lincoln, who provided a wealth of information upon radical publisher of the 1790s, Daniel Isaac Eaton. Edmund’s paper demonstrated the power of the printed word and how the repressive Government at the time were anxious to prevent publishers disseminating this type of material. To close the day, the conference held a wine reception and optional conference dinner. Conference delegates mingle at the wine reception which concluded Saturday’s proceedings. Conference organisers, Professor Judith Thompson, Professor Paul Elliott, Dr Paul Whickman, Kathryn Hindmarch and myself wish to express their gratitude to BARS for their generous conference subvention which supported this event. This looks fabulous–I so wish I could have gone, but couldn’t do this and BARS (where I read a paper on Thelwall as it happens!). Your work on Smith sounds fascinating–I’ve done something separately on Smith and, though there are shared themes, I never thought to bring the two together.